Continue reading to learn more on how to prepare your child and your family before it's time to start school. You are your child’s first – and most important – teacher. In your role as parent, you will provide your child with ongoing guidance from birth and even through young adulthood. Your involvement in their education will show your child that school is important, and your encouragement, guidance, and support will help ensure that your child will succeed in school and in life. How is the school doing academically? What are children expected to learn in Kindergarten? 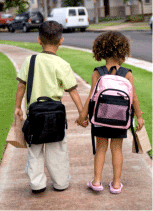 What is the distance between home and school and how will your child get to school? What are the safety procedures and policies? Is there before and after child care? Can parents visit, and what are the preferred times of day? How can parents be involved in school activities? Reading to your child can be one of the best things you can do to prepare them for the big day. Other good choices are playing music, giving your child opportunities to play with other children, and visiting the chosen school and talking to the teachers. Watch the video for more ideas on school preparation. Being involved in your children's academic career will ahow them that education is important and help ensure their success along the way. Their are many ways you can be involved and provide support - both inside and outside the classroom. Early on, start discussing going to school with your child. Talk about the importance of reading and learning with other children, and any other activities they will be doing while they areaway from home and other environments they are used to, such as child care. Becoming involved in your child's education is one of the best and easiest things you can do. This acknowledges that you care about their education, so they will too.